Well, the year has turned and the nights are drawing in but I hope you’ll join us for this month’s WI meeting on Monday 15th September. 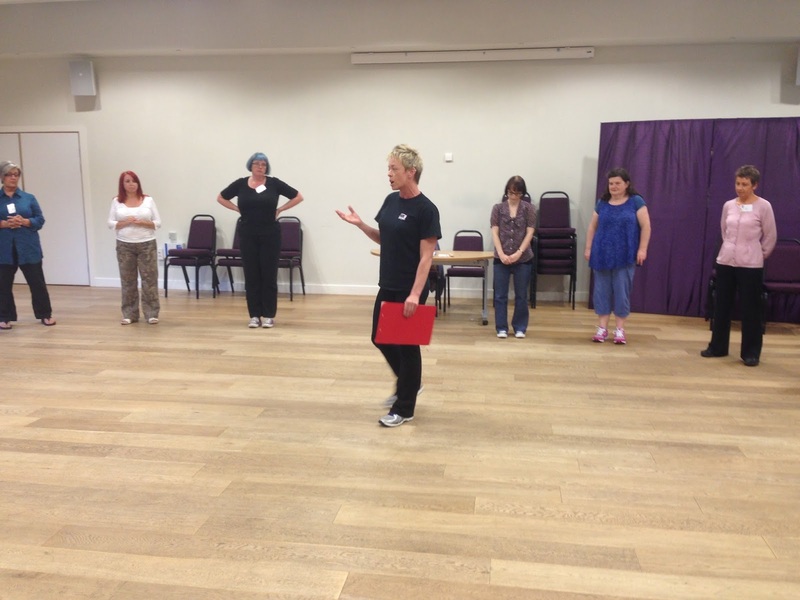 This month we’re delighted to welcome back Kate Dakers from Box 4 Fitness to teach us some self-defence basics. Kate visited us last year and it was a very popular meeting. Indeed, she’s such an inspiring teacher that several of our members have gone on to take her boxing classes, where they’ve been busy achieving awards and medals. June’s meeting was filled with energetic fun. 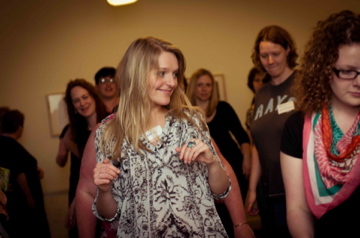 Joanna Dowey from the Northern Belly Company visited and taught us some bellydancing. Joanna brought an exciting suitcase full of spangles, sequins and wafty scarves that we raided with great glee. It was a good ice-breaker and got us all in the mood. We welcomed Kate Dakers from Box 4 Fitness with some trepidation. Rumours are rife about how strict Kate is as a boxing instructor and personal trainer, so the WI members that stood ready to take part in her self defence class, did so with a brave face and trembling knees. 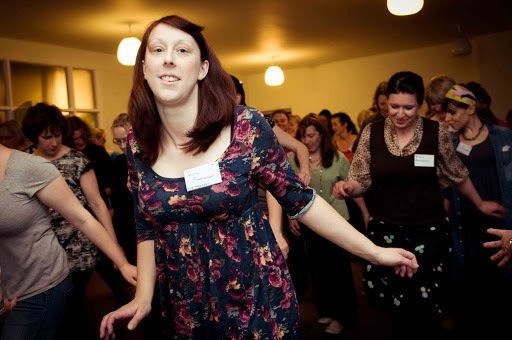 We had a huge turnout of 64 women last week for our stroll workshop! A stroll is a line dance that doesn’t require a partner, so you can cruise out on that dance floor with confidence and get busy whether you have a date or not. Now is the perfect time to be learning strolls, with all of the brilliant vintage-themed dances, fairs, and festivals going on. Well done everyone, now you need to get out there and practice! If you’re looking for lots of beautiful vintage inspiration and general good times, check out Rose & Co, The Marvellous Tea Dance Company, and maybe even The Wet Spot. 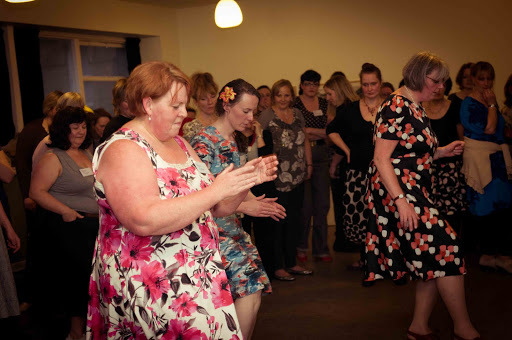 Those of you who’ve really caught the dancing bug should get talking to Amy, Caroline or Helen at the next meeting about the many dances and dance classes happening nearby. And yes, there’s burlesque fun to be had too. This Sunday the 29th of May is Spring Fling, an afternoon of vintage fun brought to you by the Sunday Afternoon Appreciation Society (ie Amy and Helen). This is a good chance to practice those strolls! DJ Red Helen will be spinning her top tunes from the 20s, 30s, 40s and 50s and you can have a right good dance on the big shiny dancefloor. 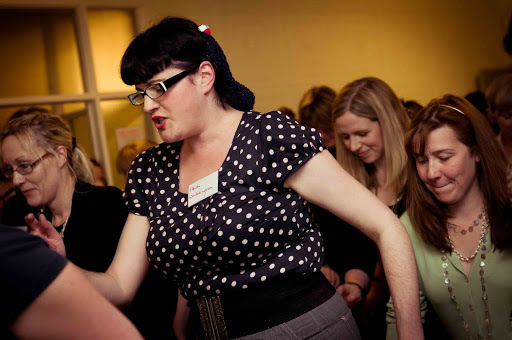 The Marvellous Tea Dance Company will be there serving their delicious tea and cake, and there will be an enormous knitting and crochet circle. We’ll be making lots of stuff for The Hebden Bridge Arts Festival Yarnstorming event, including knitted bunting, knitted yarn chains and cupcakes galore. It’ll be fabulous fun! Come to St Michael’s Church Hall (Enterprise Centre), Church Lane, Mytholmroyd – from 14:00 to 18:00. Don’t forget about the Hebden Bridge WI Rag Market on June 5th, at the Masonic Hall on Hangingroyd Lane in Hebden Bridge. We’ll be there from 12:00 to 16:00. If you have any crafty donations that we can sell to raise money for the WI, please contact Amy, Erin, or Sue Mellis. Monday June 6th is the first meeting of the HBWI Book Group, which is happening at Bar Place at 19:30. We’ll be deciding what style of book group to be, as several members have discussed the merits of a book swap style versus a more traditional style reading group. All HBWI members are welcome! Thanks to everyone who signed up for Ruth’s cake rota! We’re just about covered for the next two meetings, but we’ll need more members to sign up at each meeting. Don’t be nervous little darlings, you don’t have to bake! We just ask that you bring enough cake or biscuits to feed at least 10 people, and we don’t care if they’re bought or homemade. We’re still taking orders for the WI newsletters, of which there are 5 issues left this year. The cost is £1.45 (for all 5) if you’re happy to collect the newsletter at the monthly meetings, or £3.05 if you’d like it posted to your home. If you’re interested, please contact Erin directly as soon as possible, as the order for July needs to be placed this week.